It’s no secret that I’m a huge fan of the work of Richard Marsh (1857-1915), who was an incredibly successful author of mystery, horror, and generally weird fiction in the late Victorian and Edwardian eras. Marsh was famous in his own time — his breakout novel, The Beetle (1897), even outsold Bram Stoker’s Dracula (1897) the year of its release — but faded to relative obscurity after his death. Judith Lee is Marsh’s version of a Sherlock Holmes-style investigator, with a unique skill: as a teacher of the deaf, she has mastered the ability to perform lip-reading at a distance in multiple languages! This talent is both a curse and a blessing, as it inadvertently thrusts her into dangerous situations just as often as it helps her escape. The stories are charming, and the Black Coat Press edition is excellent, including a nice introduction by editor Jean-Daniel Brèque. For those intrigued, I share some more thoughts on the character of Judith Lee, and her adventures, below. The first Judith Lee stories originally appeared in The Strand Magazine between the years 1911 and 1913. The Strand* was a perfect place for an intrepid, larger-than-life fictional detective to make an appearance: the very first Sherlock Holmes short story, A Scandal in Bohemia, appeared in the July 1891 issue of the magazine, and dozens more would appear up through 1905 (including the novel The Hound of the Baskervilles, published serially in 1901-1902). With a huge readership clamoring for stories of ultra-clever investigators, it was a natural place for the famous Marsh to place his Judith Lee tales. Most of The Strand stories were later compiled into a book — Judith Lee, Some Pages From Her Life (1912) — and unpublished stories were posthumously collected into a second volume, The Adventures of Judith Lee (1916). The Black Coat Press edition combines the contents of both books, and one story that has previously only appeared in The Strand. Those expecting Judith Lee to represent Marsh’s female interpretation of Sherlock Holmes will be in for a surprise, though arguably not disappointed. Lee is not a professional detective, and in fact shies away from getting involved in mysteries and criminal affairs whenever possible. Her ingrained ability to read people’s lips from a distance makes it difficult for her not to learn about unlawful activity, however, and her genuinely fiery sense of justice makes her take action against evildoers, almost against her will. Had he not done that I have little doubt that I should have been too conscious of the pains caused me by my bonds — the marks caused by the cord were on my skin for weeks after — to pay such close attention to their proceedings as I did under the spur of anger. Quite possibly, that tell-tale whisper would have got unnoticed. Absorbed by my own suffering, I should have paid very little heed to the cryptic sentence which sadly proved to be their undoing. It was the outrage to my locks which caused me to strain every faculty of observation I had. He had much better have left them alone. From this childhood adventure, Judith Lee proceeds onward to become involved in a variety of criminal cases, dealing with murderers, robbers, burglars, abusers, con-men, and even spies! Ms. Lee is up to the task, however: she demonstrates skills in jujitsu, disguise, and multiple languages, in addition to her adept reasoning skills and lip-reading abilities. The set of stories are much too varied and numerous to give a detailed description of them here, so I will just mention a few highlights. In one tale, Lee is faced with a number of diabolical assassination attempts, including the use of exploding candy, that forces her into an investigation of a mysterious pair of deaths. In another, Lee is provoked by a criminal mastermind that might very well be called her version of “Moriarty”. In one of my favorite stories, Lee’s hot-headedness leads to her being trapped in a locked building, forced to do battle with a murderous knife-wielding assailant! It was not necessarily a conscious effort on Richard Marsh’s part, but the stories tend to increase in intensity as the series progresses. Miss Lee herself becomes more famous, and by the second volume she is regularly asked to help with various cases — and actively resists involvement! She finds herself in more perilous and dramatic situations in the later stories, which overall keeps one’s interest while reading. One aspect of the stories that is somewhat distracting is the large role that fate plays. Many of the tales rely heavily on coincidence — Judith Lee manages to hear two independent conversations, widely separated in space and time, that tie together the threads of a sinister plot and merit her involvement. Lee herself, on a number of occasions, suggests that a higher power may be guiding her adventures. I suspect that Marsh struggled at first to figure out how to connect Lee’s lip reading with the plots he invented; the role of fate becomes less obvious in the later stories, however. “The next man to whom I may render a little service may be that person down there with a big, black beard, his hands in his pockets, his hat on the back of his head, and his pipe in his mouth. It doesn’t follow because, in pursuit of my hobby, I may render him a little service that I should want to carry it further, does it?” Her smile robbed the words of much of their sting. I am a woman, and sometimes women are almost as illogical as men, though not often — and perhaps that is one reason why I felt bound to see the matter through. It would perhaps be too much of a stretch to deduce that Marsh was a feminist, but his works like the Judith Lee stories really show a view of women that was atypical for his time. The Black Coat Press edition of Judith Lee is an excellent collection of Richard Marsh stories, and a very nicely-put together volume. Recommended for fans of Richard Marsh and of early detective fiction. * Incidentally, The Strand went out of business in 1950, as fallout from the hardships from World War II. It was resurrected in 1998, however, and still continues today. This entry was posted in Mystery/thriller. Bookmark the permalink. Alas, this is the only edition that will probably be made! Mrs Fazackerley enjoys crime fiction (and historical fiction). I got her this for Christmas. It is going down quite well, so thanks for the tip-off. You’re very welcome! Glad she’s enjoying it. 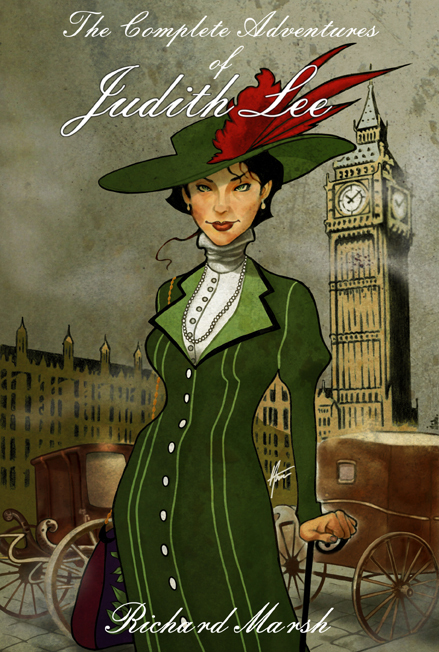 Judith Lee is apparently going to appear in the action/adventure graphic novel “Suffrajitsu: Mrs. Pankhurst’s Amazons” – http://www.suffrajitsu.com .